We are pleased to present in a 3 CD boxed set edition, Sacred Ceremonies: Ritual Music of Tibetan Buddhism. The Sacred Ceremonies series began in 1989, by recording artist David Parsons, when he traveled to Dharamsala, India to experience the mystical sounds of Tibetan ritual music. He was received by the Dip Tse Chok Ling Monastery School and given permission to incorporate his DAT recordings of their rituals into his 1990 album of original music, Yatra (18072). 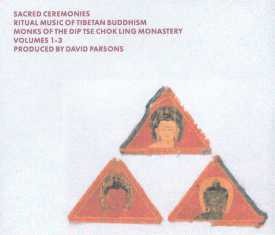 In return for the monks' kindness, Parsons decided to release selected Dip Tse Chok Ling ceremonial performances in their original state. The results were first released in 1990 on Sacred Ceremonies: Ritual Music of Tibetan Buddhism (17074). Portions of this first volume were used by directors Oliver Stone in his film Heaven & Earth and Bernardo Bertolucci in Little Buddha. When Parsons returned to Dharamsala in 1990 as part of a documentary film crew, he found that the Dip Tse Chok Ling monks had been practicing for another album. He was amazed at the difference between the two recording sessions. "The first time, they didn't understand why anyone would want to listen to what they did," Parsons recalls. "I also had to explain a lot about the recording techniques, and we had to keep rearranging the instruments to get a nice stereo image. It took three months to get the right recording. This time, the monks didn't need to be told anything. They set up completely by themselves. I just went down there, turned on the DAT and recorded Sacred Ceremonies 2 (17079) in a couple of hours." In their third album, Sacred Ceremonies 3 (13132), the monks of Dip Tse Chok Ling selected prayers to honor the memory of Lama Tashi Gyaltsen, founder of the present day monastery, and the Dalai Lama, in celebration of his 60th birthday. They also honor and dedicate this volume to all Tibetan people. The Dip Tse Chok Ling Monastery was founded in 18th century Tibet by the Venerable Yongzin Yeshi Gyaltsen, tutor to the eighth Dalai Lama. The lineage of the monastery continued until 1959, when Tibet suffered the devastating Lhasa uprising. Together with over 3,000 other practicing monasteries, Dip Tse Chok Ling was razed to the ground. Fortunately, its inmates managed to salvage many religious artifacts and documents, and escape with them to Nepal. In 1976, the Dip Tse Chok Ling Monastery was reestablished in Dharamsala, India, by Lama Tashi, and construction began in 1984 on the present day monastery. Lama Tashi lived the remainder of his life there, rebuilding and reestablishing the old way of life. Since his passing in 1992, a stupa (memorial) has been built next to the temple. Today, the monastery continues to house numerous monks and students. Producer David Parsons has explored and field recorded in many remote and wartorn areas of the globe, producing traditional and lost arts music. These series include the critically acclaimed The Music of Vietnam (19903), voted one of the top ten albums for 1995 by The New York Times,The Music of Cambodia (19902), The Music of Armenia (19909) and The Music of Islam (19907).